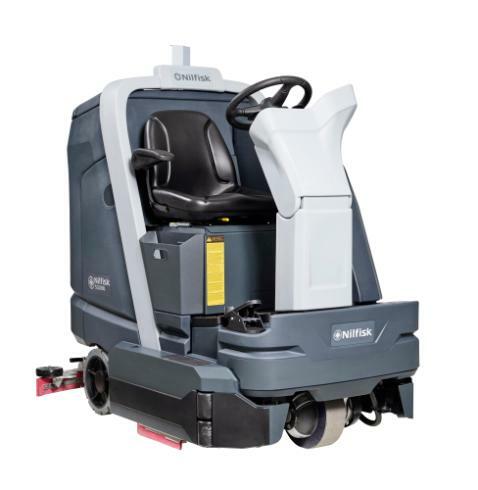 The Nilfisk® SC6000 is a next generation ride-on scrubber dryer with the size, speed, and technology to clean large indoor areas – at an extremely low Total Cost of Ownership. Available in 3 different versions, SC6000 will be the ideal solution for many companies, industries, and cleaning contractors dealing with large indoor areas such as production sites, warehouses, supermarkets, airports, parking garages and other logistical centers. Saving both water and detergent, this user-friendly machine is designed to deliver hours of superior cleaning and drying performance at a high speed. Robust and reliable, the battery powered SC6000 is built to last with limited need for service and maintenance, making it the right choice when you want efficient cleaning with an absolute minimum of downtime. SC6000 comes with the intelligent SmartFlowTM function automatically adjusting the solution flow according to the travel speed – and if you want to save more water, detergent, and power you can choose the optional EcoflexTM system. Dump and refill cycles will be few and far between – with the solution and recovery tanks both holding 190L and thanks to the limited use of water and detergent. Downtime is also minimized by the easy access to service and maintenance, supported by the embedded diagnosis system for quick identification of any technical problems. When service needs to be carried out, tools will not be necessary for most operations, e.g. the click-on disc scrub brush system, and the easy removal of the squeegee from its support since no hose connection is needed. So every detail of the Nilfisk SC6000 is designed to get the work done non-stop during its long life – at the lowest Total Cost of Ownership.